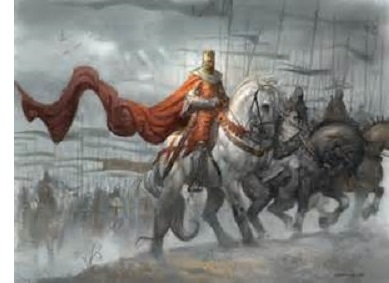 Richard I (1157-1199) - The monarch with perhaps the coolest epithet (anyone can be a "Great", but there is only one "Lionheart"), Richard I was never expected to be king of England. He was the third son of Henry II and Eleanor of Aquitaine; but his eldest brother, William, died before the age of three, and the man expected to succeed Henry II, Henry the Younger, turned against his father and died in the midst of a revolt against him (not from battle, but from disease). Richard himself had engaged in a revolt against his father when he was only sixteen, but he wisely sized up his chances of overthrowing the king, and realized that he was not powerful enough. So he made peace with his father. Even at that tender age, he displayed the qualities of a great warrior. In 1189 he tried again, and this time, with the help of Philip II of France, he became king. Henry died that year (from a severe ulcer which was probably exacerbated by his feud with Richard) and the throne was his. Of course, he also had two younger brothers who would persist at trying to usurp him (one of them would eventually succeed). Richard did not have much time to enjoy his ascension before he was called to the Holy Land to partake in the Third Crusade. But warfare was in his blood and he participated with gusto. His battles with the Muslim leader, Saladin, are legendary (see the Third Crusade below). Despite several victories in the Holy Land, he ultimately failed to take Jerusalem, and troubling news from home forced him to cut his campaign short. Messengers arrived with word that his brother, John, was positioning himself to become king in his absence. He quickly made peace with Saladin and sailed for home in October 1192. Rough seas, though, forced him to put in at the Greek port of Corfu and seek a land route back to England. He made for the German kingdom of Saxony, which was ruled by his brother-in-law, Henry. His reputation preceded him, however, and he was captured by Leopold V of Austria in December 1192. Leopold reasoned that a man of Richard's stature would literally fetch a king's ransom. He was right. After more than a year in captivity, Eleanor of Aquitaine managed to raise the £65,000 ransom. But his time in prison allowed John to strengthen his position in both England and Normandy. He forged an alliance with Philip of France, Richard's former friend. Richard now had to fight two enemies in order to reacquire his kingdom. He would spend the next five years besieging the strongholds that John and Philip had established. And he largely succeeded. However, while storming the fortress Châlus-Chabrol he received a fatal wound from a crossbow and died on April 6, 1199. John had held out just long enough to become king of England.